Santa Baby Socks are knit from the cuff down using a contrasting color for the heels, toes, and cuffs. The front of the sock is designed with a delicate, yet simple, lace pattern that runs from the cuff to the toe. The lace pattern is made using four rows of familiar stitches repeated throughout the length of the sock. The pattern is written for women’s sizes 5 - 9 1/2 shoe, but can be easily adapted for smaller or larger sizes. 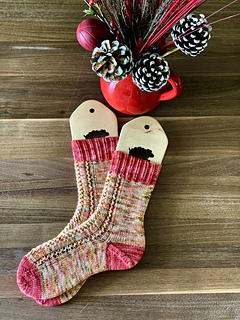 This festive, lacy sock is sure to please knitters of all experience levels!